The three primary reasons orthodontics is recommended to is correct bite problems, help clean teeth if too much crowding is present, and of course, to make your smile look beautiful. At Beers Family Dental, we offer clear aligners (for those that don’t want to have metal braces) and traditional metal braces to move teeth. 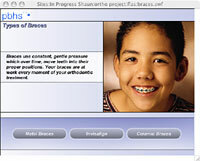 This is a great service for the surrounding community because of the more frequent “check braces” appointments. Call and ask Candi or Emily about a no cost Smile Analysis appointment to talk about your concerns and considerations for orthodontics.